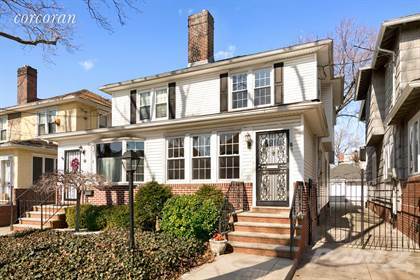 "Welcome to 85 78th Street - a beautiful 3 bedroom, 1.5 bath house with a garage in prime Bay Ridge! This sun-filled home is well-maintained, located on a lovely tree-lined street, and offers charming original details, including high ceilings and hardwood parquet floors. The first floor features an enclosed sunporch with a wall of windows, spacious living room, formal dining room, and windowed, eat-in kitchen with a separate breakfast nook. A side door off the kitchen leads to the backyard patio, a garden with a 45-year old maple tree, and a one-car garage. The upper floor contains three spacious bedrooms with ample closet space. The master bedroom is tucked away in the rear of the home and faces the quiet backyard. The second bedroom features an adorable built-in desk with floor-to-ceiling closets on each side and the third bedroom is bright and sunny with Southern and Eastern exposures, a wall of built-in shelves and drawers, and a desk. The unfinished basement features a large open space, which is perfect for a recreation/media room. This level also has a 1/4 bath, cedar closet, a separate laundry room, and houses the mechanicals. Additional features include some plumbing and electrical upgrades,10-year old roof and siding, replacement windows, and water spigots in the rear of the home. Conveniently located near 3rd Avenue's shops and restaurants and just minutes from the R subway, the X27/X37 express buses and the NYC commuter ferry to Manhattan and Downtown Brooklyn. Please email to schedule an appointment or for further details." Hi, I'd like to find out more information about 85 78th Street. Thanks so much!